Dave Andreychuk scored his 500th career goal and Doug Gilmour added a goal and an assist as the New Jersey Devils defeated the Washington Capitals 3-2 Saturday to move into a tie with Philadelphia for first-place in the Eastern Conference. 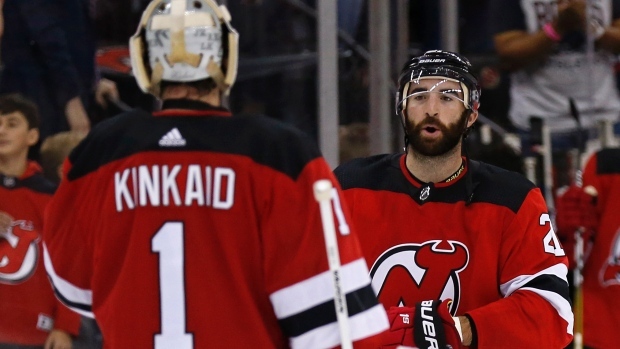 The Devils extended their club-record home unbeaten streak to 15 games (9-0-6) and tied Philadelphia with 88 points. Fittingly, Andreychuk reached the 500 plateau on one of his patented power-play goals off a rebound. Washington goaltender Bill Ranford stopped a shot by Bill Guerin, but Andreychuk drove to the front of the net, fought off a check by defenseman Mark Tinordi and tapped in the rebound with 10:57 left in the first period to give the Devils a 2-0 lead. "All the time I've been trying to get that goal, it figures that it just happened on one of those plays where I drove the net," said Andreychuk. "After the goal I looked up at my parents. It's a real big thrill for the whole family." "It must be a relief for him," said Devils coach Jacques Lemaire. "Any time you are looking for a milestone, you are thinking about it. I'm sure on some shifts he was thinking about it, and you don't get it naturally when that happens. "It was a fitting type of goal. He must have scored maybe 400 like that." Andreychuk became the 26th player in NHL history -- 11 of them now active players -- to reach the 500-goal plateau. Joey Mullin became the first American to do it the night before. Andreychuk, 33, has 24 goals in 69 games this season, his 15th in the NHL. He has 212 goals on the powerplay, and has 558 assists for 1,058 points in a career covering 1,070 games. "I look at the list and it's hard to believe I'm on it," said Andreychuk. "There are some great players on the list. I guess it's a credit to my consistency, and I've played with some great centers: Gilbert Perreault, Doug Gilmour, Pierre Turgeon and Bobby Holik. As a winger, you need someone to get you the puck." In Philadelphia, Brian Holzinger scored twice and the Buffalo Sabres chased Ron Hextall with four goals in the first 11 minutes and 34 seconds en route to a 7-5 victory over the Flyers in a battle of division leaders. The Sabres completed a sweep of the home-and-home series. Buffalo, the Northeast Division leader, improved to 11-2-6 over its last 19 games. In Boston, Anson Carter scored the goal-ahead goal four minutes into the second period and Jozef Stumpel added a goal and an assist as the Bruins defeated the New York Islanders 5-2 in a battle of two teams battling for the final playoff berth in the Eastern Conference. The Islanders are six points behind eighth-place Montreal in the Eastern Conference playoff race. The Islanders remained in 11th place, just one point ahead of Boston. At Tampa Bay, Brian Noonan scored his first two goals as a Canuck and set up another as Vancouver snapped a seven-game winless streak by beating the Lightning 5-2. Martin Gelinas added a goal and two assists for the Canucks, 0-5-2 in their previous seven games. Corey Hirsch lost his shutout bid with just under six minutes to go in the third period, but finished with 37 saves for the Canucks, who moved within four points of Chicago for the final Western Conference playoff berth. In Montreal, Bruce Gardiner scored with 11:26 left in the third period as the Ottawa Senators stayed unbeaten against the Canadiens this season with a 2-2 tie. Ottawa improved to 2-0-2 against Montreal this season and 1-5-1 in its last seven games overall. The Canadiens matched a team record with their 20th overtime game of the season, equaling the mark set first in 1937-38 and again in 1991-92. In Hartford, Jason Arnott's power-play goal with 5:30 left in the second period broke a tie and lifted the Edmonton Oilers to a 4-2 victory over the Whalers. Mats Lindgren, Doug Weight and Rem Murray also scored for the Oilers, who finished a five-game road trip at 2-3 and won for the second time in their last 11 games (2-7-2). In Florida, Larry Murphy's power-play goal with 6:58 left in the third period lifted the Toronto Maple Leafs into their fourth tie in five games, 3-3 with the Panthers. Fredrik Modin had a goal and an assist for Toronto, which is winless in its last five games but 2-1-4 in its last seven. In San Jose, Sergei Fedorov had two goals and an assist and the Detroit Red Wings turned back a third-period rally to hand the Sharks their fourth straight loss, 7-4. The Red Wings collected four power-play goals and a shorthanded tally, and are 7-1-5 in their last 13 games. At Los Angeles, Theo Fleury scored twice and Robert Reichel added a goal and an assist as the Calgary Flames defeated the Kings 5-2. Fleury and Glen Featherstone had empty-net tallies in the final minute for the Flames, who have split the first six games of their seven-game, 16-day road trip. -- The San Jose Sharks, the NHL's worst team, lost their top center for the season when Bernie Nicholls underwent hernia surgery Saturday morning. The procedure was done by Dr. William Brown at Stanford Hospital. The Sharks placed Nicholls on injured reserve, retroactive to March 11, when he played his last game. The 35-year-old Nicholls, signed away from the Chicago Blackhawks as a free agent on July 30, is San Jose's third-leading scorer with 12 goals and 33 assists in 65 games. He joins defenseman Al Iafrate as Sharks who have undergone season-ending surgery. Nicholls collected 19 goals and 41 assists in 59 games with Chicago last season. He has 469 goals and 710 assists in 1,057 career games with Los Angeles, the New York Rangers, Edmonton, New Jersey, Chicago and San Jose. The Sharks have a league-low 53 points and are 13 points out of the final Western Conference playoff spot with 14 games remaining. -- New York Rangers left wing Luc Robitaille suffered a broken foot getting off the team bus Friday night, an accident that likely assures him of staying with the team past the trading deadline on Tuesday. Robitaille has expressed his desire to remain in New York and general manager Neil Smith will now find if difficult to move a player that will miss four to six weeks. The 32-year-old Robitaille fell getting off the bus prior to Friday's 4-3 win over the Senators in Ottawa. "I've never missed games with an injury," Robitaille said. "It's devastating."